Forex Analyzer PRO is an accurate no-repaint versatile trading system that can be used on any currency pair and time frame. It also includes some other interesting functions such as daily range pips fully automated detection alerts, email alerts and mobile trading alerts. This is one of the best forex trading systems for scalping, day trading, swing trading and position trading. Recommended Trading Sessions: London & US for scalping and day trading style, 24/7 for swing-and position trading style. The figure above shows Forex Trend Analyzer PRO in action on the H4 Euro/US Dollar chart. 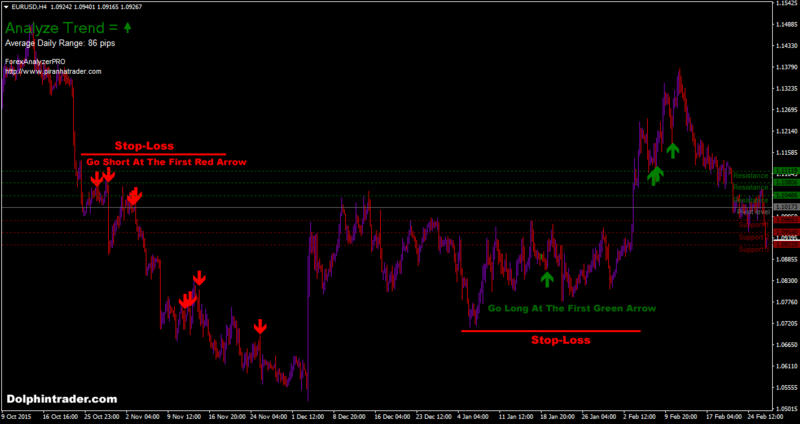 The green and red arrows provide you with excellent trading signals. For best results, it’s highly recommended to go long at the first green arrow, or, go short at the first red arrow. Stop-Loss: It’s recommended to place the stop-loss below the most recent support level, it keeps the trading risk low. Take profit method: Risk:reward 1:2 or better ( risk 50 pips, make 100 pips). Alternatively, close the buy trade at the first red arrow: bearish trend reversal. Stop-Loss: It’s recommended to place the stop-loss above the most recent resistance level, it keeps the trading risk low. Take profit method: Risk:reward 1:2 or better ( risk 30 pips, make 60 pips). Alternatively, close the sell trade at the first green arrow: bullish trend reversal.